In my last post, we analyzed reef fishing and took a deeper look into some of the techniques, such as fishing with explosives and poisons, utilized by fishermen to catch more fish while putting forth minimal effort. In order to shed even more light on this topic as was promised in my last post, we will be taking a closer look at the potential impacts of reef fishing. For the sake of maintaining a moment of positivity, I would like to begin by delving into a benefit of reef fishing. As has been seen on many different occasions, reef fishing has resulted in the bolstering of many local economies, most notably in Southeast Asia and East Africa.1 Prior to the introduction of reef fishing, most citizens in places such as the Philippines and Tanzania faced the issue of not being able to provide a livelihood for their families. However as a result of being introduced to the reef fishing realm, they were able to capture large amounts of fish and sell them to eager buyers at various prices.2 Some more luxurious species are valued up to half a million dollars. 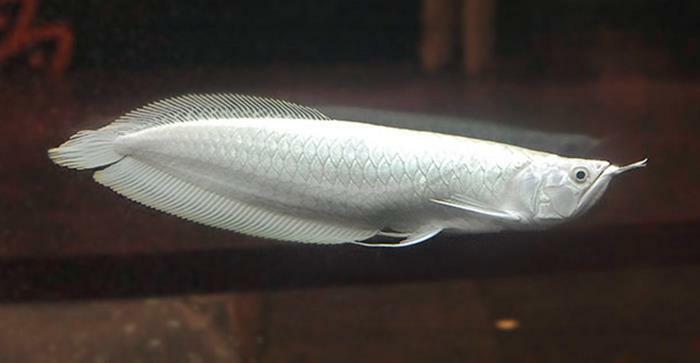 For example as shown in Figure 1, a Platinum Arowana sells for ~$400,000. Imagine being a poor fisherman in Tanzania, making this rare catch and being able to bring that amount home to provide for your family. It would be life-changing. Unfortunately, it is time to examine the more dire impacts of reef fishing. Given the amount of money that exists within the reef fishing industry, it should come as no surprise that different reef fish species are often overexploited, or overfished. This is an issue because these unnatural changes to reef fish composition change the dynamics of the coral reefs. Every individual organism plays a specific role in the coral reef ecosystem, and when a vast majority of them are no longer available to do their jobs, the ecosystem becomes more susceptible to other threats, such as the long-term starvation of a fellow fish species. For example with the ‘fishing down the line’ phenomenon, we see fisherman overfishing smaller reef fishes that serve as food sources for bigger reef fishes.1 Consequently thus further disrupting reef dynamics and resilience, the bigger fishes are left without food, and many ultimately starve to death. 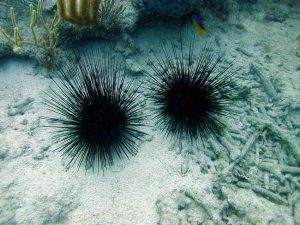 Keeping with this topic, it is important to note that overfishing also has long-term effects on reef organisms other than fish. For example when grazing herbivores are overfished, algae can grow almost completely unencumbered. The presence of algae is beneficial to the ecosystem, but only at a certain amount. Excess algae “increases a reef’s susceptibility to coral bleaching” given the fact that it has the potential to introduce pathogens, disrupt helpful bacteria and inhibit oxygen from coming in.4 Furthermore in another example, predators of grazing urchins keep the urchin population and bioerosion levels in check. However when their predators are overfished, the urchin population and bioerosion levels multiply exponentially.4 Figure 2 shows what some of these grazing urchins look like. Fishermen can also be negatively affected by overfishing. While the reef fishing industry is fairly profitable, it can only remain that way when there are actually fish present in reefs to catch. Overfishing has led to the rapid decline in a variety of reef fishes, such as the kala and bluefin trevally.1 Because of this, reefs as a whole are declining in the number of fishes they actually house. Consequently, fishermen are at an impasse where they must decide whether to continue or stop fishing altogether in order to allow these fish populations to rebound and return to equilibrium. Most fishermen have decided to continue fishing, and as a result, their businesses are suffering due to decreased product availability. By delving deeper into the effects fishing has on coral reefs, we were able to see both the highs and lows of such human actions. That being said while humans are able to benefit financially, it appears that, as a whole, reef fishing tends to have a negative effect on every organism involved, even the aforementioned humans. Therefore in my subsequent blog post, I hope to shed light on possible solutions that could be implemented in order to address these negative impacts. Because if things are allowed to continue down this path, many coral reef ecosystems will soon find themselves beyond repair. 2 Jackson, J. B., Kirby, M., Berger, W., Bjorndal, K., & Botsford, L. (2001). Historical Overfishing and the Recent Collapse of Coastal Ecosystems. Science, 293(5530), 629-637. Retrieved March 23, 2017. 4 Bellwood, D., Hughes, T., Folke, C., & Nyström, M. (2004). Confronting the coral reef crisis. Nature, 429, 827-833. Retrieved March 23, 2017. This entry was posted in Uncategorized and tagged 2017, bioerosion, fisheries, Ivana, overfishing. Bookmark the permalink.